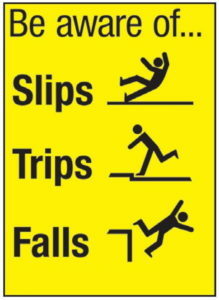 Don’t let a Fall, Trip you up! Everyone has experienced accidental slips, trips and falls and in most cases the result was some bumps, bruises and scrapes, however, for the frail and elderly population a slip, trip and fall can lead to a worse quality of life, increased medical problems and in many cases even death. Slips and trips that result in an unintentional fall, is the leading cause of injury-related deaths for individuals aged 65 and older, according to Injury Facts 2016, the statistical report on unintentional injuries created by the National Safety Council. A slip occurs when there is not enough traction between your footwear and the surface you are on. A trip occurs when your foot hits an object unexpectedly. Traumatic brain injury, hip and other bone fractures are just a few results that can occur from a fall. These types of injuries will severely impact the elders’ independence and way of life possibly leading to major changes in their living situation. If you question the safety of an elder in their own home, it might be a good time to step up and do an in-home fall-prevention assessment. Use nightlights or motion sensor lights at night and have good lighting during the day. Uneven walking surfaces, wrinkled carpeting should be removed or repaired. If a cane or walker is needed for stability, encourage its’ use at all times. Focusing on the fall prevention strategies listed above and making the necessary changes in the home environment can help to decrease the risk of fall related injuries and keep our elders safe at home. ← Summer Time…Summer Time….Fun, Fun, Summer Time!